Woman Vision was founded in 1993 to promote equal treatment of all people through the production and use of educational media, including video. Through diversity trainings, lectures, and other educational outreach programs, Woman Vision promotes the values of understanding and diversity, and provides positive role models and supportive images of societally marginalized people. Woman Vision is a 501(c)3 public charity. To date, these films have received more than 46 awards—by LGBT, Black, Latina, Latin American, and Aging Media film festivals, including best of show award, grand jury awards, and audience awards, in the U.S., U.K., Australia, Cuba, Mexico, and Italy. For the first time, Woman Vision and EyeBite Productions are making the contents of our award-winning series Unlearning Homophobia available, free of charge, online. This series directly and specifically addresses issues of religion and homosexuality. Find out more. 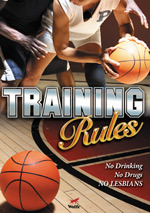 Training Rules examines how women's collegiate sports, caught in a web of homophobic practices, destroys the lives and dreams of many of its most talented athletes. Your donation helps Woman Vision staff ensure that our award-winning films are available for diversity trainings, lectures, and other educational programs. * Donations are processed through Network for Good. Woman Vision is a 501(c)3 public charity.